Over the past ten years, Arnold has played an integral role in the Mission’s success with the opening of the building addition in 2011, the Mission 10 Miler, earning the 4 Star Charity Navigator, 2014 United Way Community Impact Partnership, and restoring God’s call for the Mission. Among many other things, Arnold sets out to fulfill the vision set by the Board of Directors and ensure that the Mission is Christ-centered organization. Arnold has a B.A. in American History from the University of North Carolina, Chapel Hill and a Masters of Divinity from Gordon Conwell Theological Seminary. Arnold lives in Frederick with his wife, Beth, and has four children Nathan and his wife, Jen, and their daughter Elissa, Catherine, Daniel and Elizabeth. In his free time, Arnold enjoys spending time with his family, biking and studying the battles won by the South in the Civil War. Amy has a B.S. in Accounting from Messiah College and is CPA licensed. Prior to the Mission, Amy gained four years of experience at a regional CPA firm. Volunteering since 2011, Amy is excited to be a part of what God is doing at the Mission by managing finance. Amy lives in Frederick with close friends and enjoys running in her free time. As a 2003 Changed Life Recovery Program graduate, Carlton is perfectly suited in his role to help the men of the Mission. After graduating from the program in 2003, he attended Frederick Community College and earned a degree in Human Services while working as a counselor at the Mission and the Department of Corrections in Hagerstown/Baltimore. Originally from Washington D.C., Carlton moved to Frederick to start his new life with the Lord. Leesa joined the Mission in June, 2018. An experienced marketing professional, she owned her own graphic design and marketing company for 17 years prior to joining our team. Volunteering for years with her church, caring for horses at Days End Horse Farm and as a Court Appointed Special Children’s Advocate for the Mental Health Association, she felt God’s call to join the Mission when her son graduated high school. Leesa is originally a native of Texas and moved to Maryland when she met her husband just over 20 years ago. In her free time, she enjoys studying genealogy, baking fancy cakes, oil painting, hiking & biking with her son & husband and hanging out with her big dog. Prior to her role as the Volunteer Coordinator at the Rescue Mission, Carolyn served here as a volunteer and observed firsthand the impact the Mission makes and the vital role of volunteers. She attended Penn State University and Frederick Community College and obtained her MD Realtor license. Carolyn devoted many years to homeschooling her two children and has also worked with individuals with disabilities in the Frederick community. She enjoys gardening, home renovation, and spending time with family, friends. Meg Yoho joined the Mission part-time in 2016 as the Public Relations Coordinator. Prior to her time at the Mission, Yoho attended Penn State earning a BA in Journalism. Yoho and her husband, John, live in downtown Frederick and she enjoys reading, biking and other outdoor activities in her spare time. Valerie joined the Rescue Mission staff in 2013, bringing with her 7 years of experience working for nonprofits. Valerie has a B.A. from Randolph Macon College and is a Certified Volunteer Administrator. Currently, she is working on a Certification in Nonprofit Management from Virginia Commonwealth University and an MPA from the University of Baltimore. Valerie lives in Frederick with her husband and enjoys reading in her free time. Greg Lamp joined the Mission over eight years ago as the Rescued Treasures Program Manager. Part of his position entails running the recycling division of the Mission, working with vendors and picking up donations. A former graduate of the Changed Life Recovery Program, Greg grew up in Baltimore, MD. He attended Hagerstown Community College and obtained a Certification in Warehouse and Logistics Management. He now lives in Hagerstown, MD, enjoys baseball and football, and roots for the Orioles and Ravens! Jake, graduate of the CLRP, recently joined the Mission in 2015. During his time at the Mission, he has demonstrated great leadership skills, sound faith and strong character. In addition to his position at the Mission, Jake is currently attending Frederick Community College in order to earn a degree in Human Services Addictions. Jake enjoys playing sports, exercising and spending time with friends and family in his spare time. Previously a graduate of the Changed Life Program, Guy has served at the Mission in various roles since 1996. 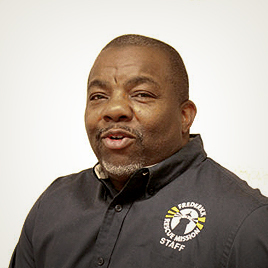 His current position entails overseeing the Food Resources Center at the Mission by developing and maintaining relationships with local partners and food donors. Previously, Guy attended Frederick Community College and he grew up in Mt. Rainier, MD. Guy lives in Pennsylvania with his wife and has two children and a grandson. In his free time, Guy enjoys spending time with his family, fishing, hunting, and farming. As the Outreach Coordinator, Teri plans ways for the Mission to serve and meet the needs of the community in Frederick. Teri has a B.S. from Frostburg State University and MARE from Southwestern Seminary. Teri lives in Walkersville with her husband of 22 years, Keith, and has two children, Ryan and Tyler. In her spare time, she enjoys line dancing, bike riding, and playing tennis. Gus has served at the Mission since 2008. A former graduate of the program, he enjoys using his time to give back and continue to serve those in need in the community. Terri joined the Mission in March 2018. In her role, she assists women and children experiencing homelessness find healing and hope in the Lord and the strength to push through their circumstances to create a life of self-sufficiency. Terri earned her BS from the University of Toledo and gained over 24 years of experience in the Education world in both instructor and leadership positions. In her spare time, you will find her enjoying time with her husband, reading, or escaping to Florida or Oregon to spend time with her son and daughters.